LEE’S SUMMIT, Mo. – Kansas City Scout teamed with KSHB TV and 3rd Dimension to launched a free mobile traffic camera service for Kansas City area residents and commuters. The advertising supported service, named KSHB Traffic Jam Cell Cams, targets the more than 150,000 daily commuters in the region who will now be able to view traffic tie-ups on their mobile devices before leaving their home, office or school. 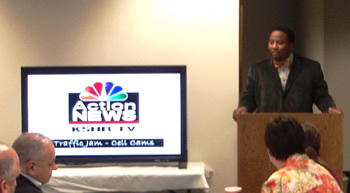 The KSHB Traffic Jam Cell Cams application is compatible with data enabled phones on the Sprint, Verizon Wireless, AT&T and T-Mobile networks, and including popular smart phones such as the BlackBerry, Palm Treo and the Motorola Q. To download the video application, commuters have the option to call 877-JAMCAM8 (877-526-2268) from their cell phone, go to the www.kshb.com website and request the service by entering their mobile phone number, or typing www.3tcam.com/kansas city on their cell phone’s web browser. Once the application is downloaded, drivers can choose to view near real-time traffic images from any of the cameras along their route and can even program keys on their phone to quickly access their favorites.